Last time we discussed three basic forms of chains – simple linked chains, loop in loop chains, and wire weaving. The reason that I needed to discuss those things was because we need to start looking objectively at the words we are using to describe a craft. And this time we are supposed to talk about Weaving, Nahlbinding, and Knitting. Why? Because our ultimate topic is Wire Weaving. If we enforce the idea of the name of a process being correct, based on the definitions of the words in that name, we need to look at each word separately. The chains that we have looked at all use wire, but the way in which that wire is used is dramatically different. According to the name of the chain we are supposed to be talking about a type of weaving. Dictionary.com gives this definition of weaving: ” to form or construct something, as fabric, by interlacing threads, yarns, strips, etc. ” OK, I have to admit that my personal definition tends more towards the warp and weft theory of fabric construction, but if we use their definition, we are OK.
As always, being a crafty geek I don’t do just metal work, I also spend a lot of time doing fiber things, and one of those things that I tried was Nahlbinding. Now one of the first things that you will notice about this craft is that no one seems to be able to agree on how the name of the technique should be spelled. Why is that? Because every Scandinavian language has their own word for the technique, and they are each slightly different. But getting back to the basics of the technique… guess what? 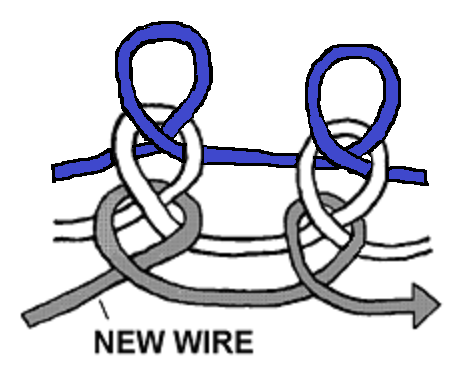 The pattern that is used for the classic “Viking Wire Weaving” is the same as the Coptic stitch in Nahlbinding. I had also been involved for a long time with the study of Nahlbinding vs. Knitting, and the arguments about which came first and where they both originated. So discovering that the Vikings were using the same technique for working in both wire and fiber was not really particularly shocking to me. Another unfortunate name for wire weaving is Knit Chain. But at least to Knitters, knitting means something very specific. 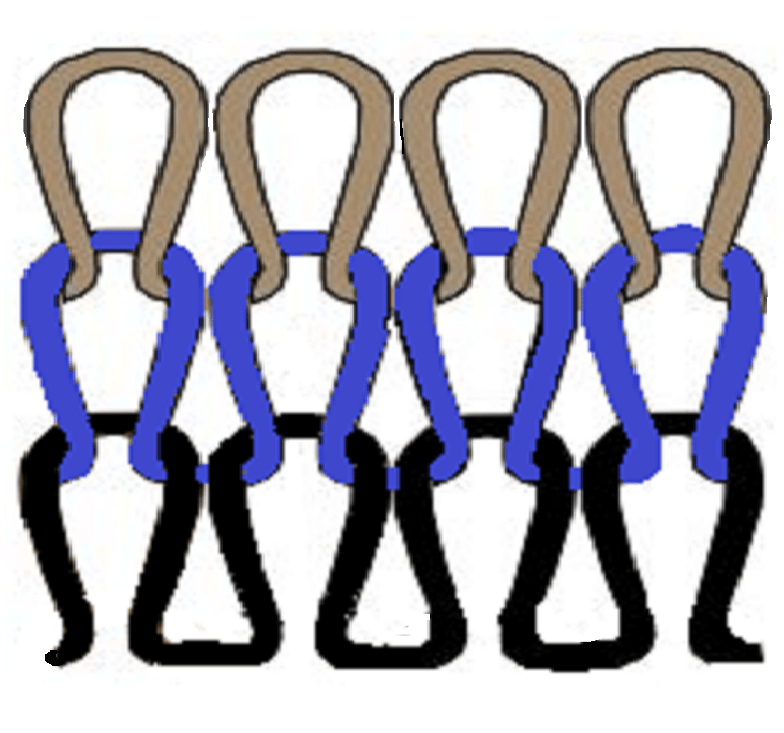 The graphic below shows the structure of a simple knit piece, a very different structure from Nahlbinding. Just in case you have forgotten, this is the structure of Nahlbinding. 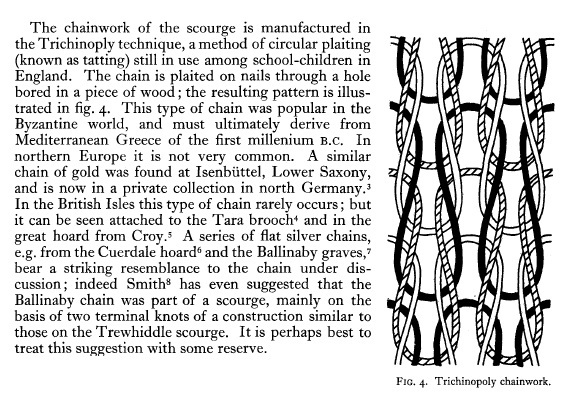 So obviously, Wire Weaving, or Viking Wire Weaving, is NOT a knit chain. Next time: Wire Weaving and Trichinopoly: Are they the same?